This monumental tapestry depicting a bonfire upon which Saint Paul directs a book burning was part of a set commissioned by Henry VIII. It is on view at Franses, London from October 1-19. In the UK for conservation, it will be go on view at London tapestry specialists, Franses, from October 1-19. The monumental tapestry - nearly 20ft wide - depicts a spectacular bonfire upon which Saint Paul directs the burning of irreligious books of magic. A strongly political work that raises the timeless issues of power, censorship and the control of ideas, it was ordered by Henry VIII during the 1530s around the time of the Act of Supremacy. Pieter Coecke van Aelst provided the design (the preparatory drawing survives in Ghent and a fragment of the full cartoon in New York) that was later woven at huge expense with gold, silver and coloured silk threads. Thomas Campbell, a former director of the Metropolitan Museum of Art and authority on Renaissance tapestry who studied this lost set for his 2007 book Henry VIII and the Art of Majesty: Tapestries at the Tudor Court, has described the rediscovered tapestry as “the Holy Grail of Tudor tapestry”. 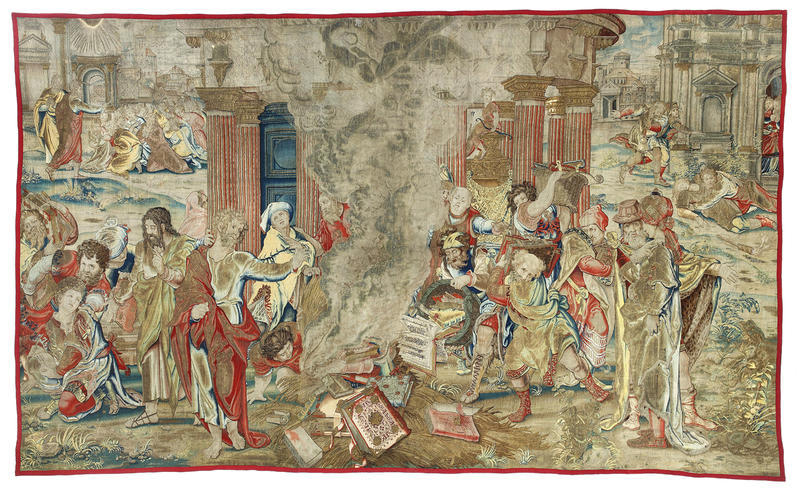 It is the only known survivor from the set of nine woven compositions depicting events from life of Saint Paul that were delivered to the court from the Low Countries in 1538-39. Listed in an inventory of Hampton Court on the king’s death in 1547, and later at Windsor Castle until the 1770s, this particular weaving is thought to have remained in England until the late 1960s when it was acquired a dealer in Barcelona. Currently the tapestry is part of a private collection in Spain. In England only temporarily to be cleaned and conserved, it is one of four Henrician tapestries and two later Tudor textiles which will be exhibited at Franses this autumn. Thomas Campbell will be giving a free public lecture, with tickets on a first come first served basis, at the Royal Academy of Arts on Saturday, October 6 at 3pm titled: The Art of Majesty: Henry VIII’s Tapestry Collection.